I grew up around comics. My dad always had Spider-Man, Batman, The Avengers, and Spawn comics inside an old cooler. My dad liked comics, but he didn't share my same level of appreciation for them. As a result, he gave me all the comics he ever owned for my own personal enjoyment. I always enjoyed reading them, but I wasn't interested in making my own until I read Wanted. I realized "Wow, I can actually make my own characters and create my own story! Not just men in tights, but actual full-blown stories." So I began writing comics at 16, broke, and couldn't draw aka a recipe for disaster. Even through all that, at 25 years old, I'm glad I got all those horrible experiences out the way and allowed me to learn from my mistakes. Or else, Devil Sunrise wouldn't have existed! I've always been a huge lover of sci-fi and fantasy movies, comic books, and general geekery. As such, doing a project that drew inspiration from some great things that I love is something I've wanted to do for a long time. I didn't get the idea for Outer Spaces until I was having a really terrible day, and someone gave me some really encouraging words. I ended up turning those into the first strip, and since then I've been trying to share positive thoughts from my days, in the hopes that they can encourage other people too - or provide a smile, at the very least. It's a weird sci-fi/fantasy/slice of life mixture, but I like where it's headed. Ever since I was a kid, I was really into storytelling. At summer day camp, a lot of the little kids would stick by me because I was one of the older kids BD and we would all lay on the floor of the gym and draw while I told stories. I was a very expressive story teller. It was usually some made up stuff about aliens and monsters and whatnot. I think I was very inspired by Invader Zim at the time. I was actually making up stories meant to be comics since I was 9. It was always very ridiculous sci-fi stuff but they all had a pretty solid premise, despite how young I was. For Creoenilists specifically, the premise was made on a whim in an RP one day and then I spent 3 years expanding on the world building and outlining the plot. Guess I could say I was inspired because I wanted to finally tell a fleshed out story in a format I'd been practicing for a very long time but to also actually share my story this time. I was doing an EnterVoid comic 'battle' against a friend and found that I really enjoyed drawing my old clown oc and her family, so I ended up expanding that universe. I became obsessed with the characters and their world. When I saw that "January Comics Month' was coming up, I wrote a short script and drew the first story in my comic. I enjoyed it so much, I just kept making up stories for Cirque du Royale. I like having something to focus on besides my depression. It kind of gives me a reason to get out of bed, even if it is a silly comic. I would have to say my love for comic books, comic strips, and manga is got me into drawing comics. The fact that is one of my dreams, and the fact that i dont wanna dream with my dreams anymore, i want to live them. https://tapas.io/episode/651018 long story, long chapters and a dream made true for myself. i hope you like it. Honestly? I'd been wanting to write comics all my life. I was always just so uncertain. And I still am, even now. I always see so many people that are better than me and so much more interesting. I noticed that my writing skills were much better than my artistic ones, so I tried to write. That was fun for a while, but I could never figure out a serious place to show my work, and I knew it would never be taken seriously. So I tried. I started writing ALONG with pictures. I'm still no good at comics, but I'm better than I had been. The overall negative state of the world. The urge to do something about it. I had the idea for a three person team, each with specific personalities, but I just couldn't figure out what type of story to put them in. Originally I was trying to force a story about a team of nightmare fighters, who protected kids from their fears at night, but I just couldn't get a plot together. Rather than keep trying on a failing story, I decided to take a step back and just think it through. I asked myself, "what types of stories do I like". I realized that I love stories that have to do with time travel, and from there the idea for my new comic, Stop Watchers, was born! The whole time I wrote it the only question I asked myself, and continue to ask myself, is "if this wasn't my comic, would I be a fan of it" and so far it's "YES!" which makes it that much more fun to make. What made me make mine was Haley Newsome (lavendertowne). I watched a lot of her videos and read her comic- Unfamiliar- and it made me realise that my art was good enough to put out onto the internet. And I'm really glad I did- it's fun making a comic! I started out as a fan, reading manga first, then later on I got into american comics.For years I've had ideas for a series,making my own little world up in my head, and writing the ideas down when inspiration hit me. Just like a lot of people here I was inspired from cartoons and anime especially Pixar films such as UP and treasure planet with its amazing story telling and strong characters. As well as my favorite cartoons Avatar the Last Airbender teaching me a lot about character growth, character motives and word building. It wasn't until I was watching an interview with Rebecca Sugar creator of Steven Universe answer a question about how to become an animator and she said that you become one by literally just doing it and that was one for the main reasons for me to actually get up and draw my monster comic DEVILS NIGHT I've been working on recently. I've always been sort of into graphic novels, but I started reading webcomics around two years ago! My love for writing, as well as the comics I really liked, inspired me to turn my story ideas into a comic. :> I've always loved writing stories and drawing, but I'd never shown my works to a larger audience until Chasing Little Lights. I was inspired by my own dreams, because my dreams are strangly interesting to say the least. This was one of those ideas where I started with a story (my dream) then made characters that could fit in to it. About a boy who falls asleep in the bus to wake up to an island full of people who wanted to escape the harsh reality like him. New episode every Friday. Up until a few weeks ago when I started drawing my comic, I'd only really ever drawn fanart for a few fandoms. I had always wanted to draw a comic, but my brainchild just isn't ready to be transformed into a comic quite yet, so I needed a new idea. I've always enjoyed reading manga and a couple other webcomics, so that added to my ability to feel like "Okay, I can do this." 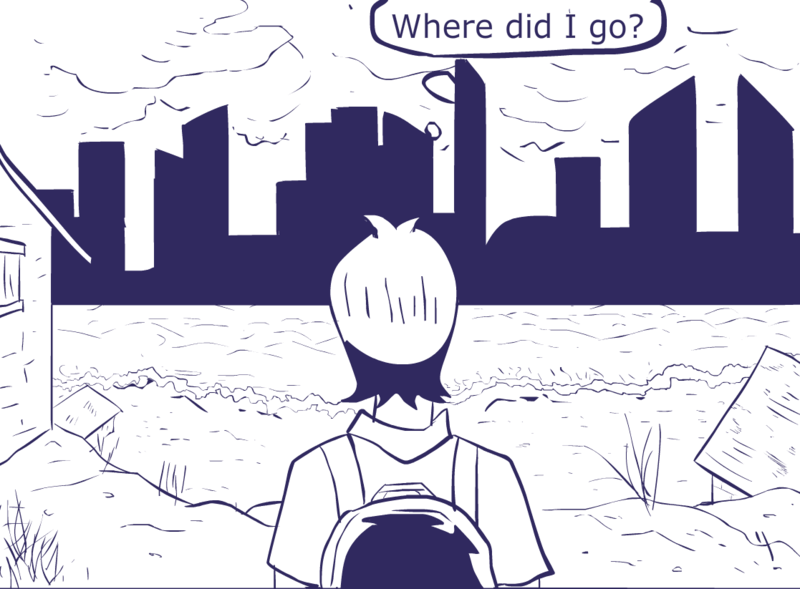 My current comic was initially inspired by the salt flats that are located in South America. I always liked how they just mirrored the sky and the surrounding landscape and originally I was going to tell a story of going into a world that mirrored our own, but everything was different to some extent or another. But I enjoy space travel and sci-fi/fantasy elements too much and then found myself incorporating a mystery as to why travel to some of these places might be impeded, and thus my comic series, Mirror Jumper got sparked. Of course, I also am drawn a bit to romance but, I didn't want that to be a primary focal of my comic, so if there's enough interest in MJ, I may plan to do a comic series revolving around the characters in my story and go more in depth in the story of their relationships.